Baby A is a multicutural baby because as you know that her mom is Balinese and her dad is Swede. So, she is definitely should learn both culture no matter what 😀 This is not just an order but this is also a pray, hope, dream and commitment that we have made as her parents. 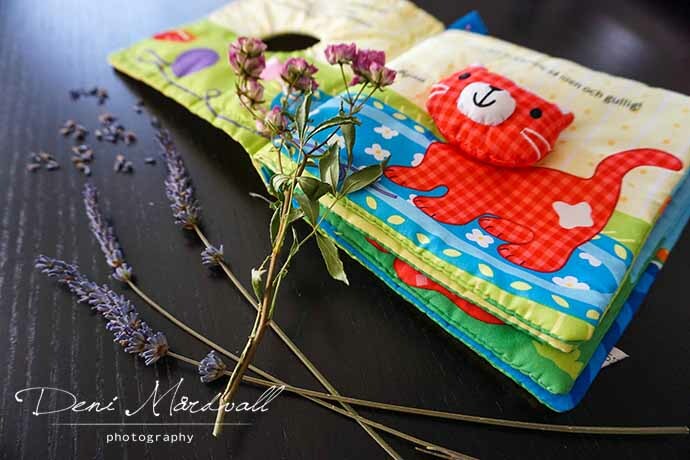 This is one of many reasons why since I was pregnant, I bought a couple of children books in many different languages such as in Swedish, Indonesian Language and English. Well, actually most of baby A’s Swedish books, she gets them from her dad, some of them gifts and some of them I bought in flea market around Stockholm. Her books in English were bought when we lived in Windsor back in 2005-2007. The books in Bahasa Indonesia, mostly I bought them recently. 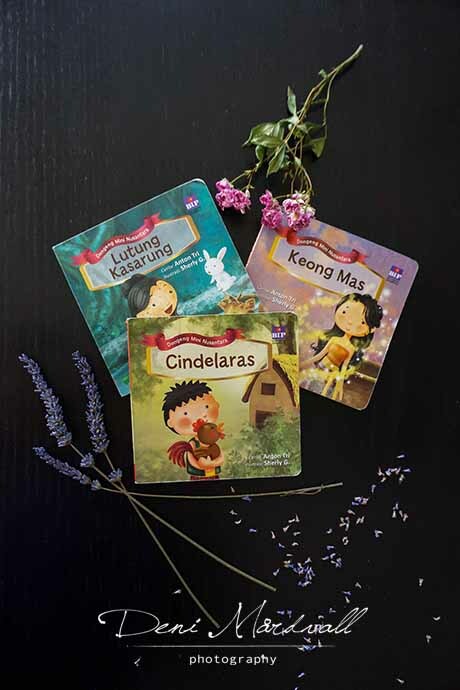 Last year, when I got chance to visit my family in Bali, I bought some Indonesian children fairytales to complete our Sunshine’s library in her room. Not many of them but enough for her to choose which one suits her age. I bought it in many differents length of text because I thought that it would be nice to pick later on which one is long enough so baby A would not get bored easily by hearing her mom reading it. Soon, we are going to Bali to visit my family and definitely would buy some more books. I have in mind to buy some Balinese book with the purpose that one day, if baby A is old enough, I would start to introduce Balinese language to her. Hopefully she would have interest to learn it even further. At home, I speak completely Indonesian Languages with her. Well, there is some exception though for example when farfar and farmor come to visit, then I will speak (mostly) Swedish and Indonesian to her. Sometimes, I translate to farmor or farfar when I speak Indonesian to Sunshine in front of them. For me, it is not a big deal to do some translation because it is definitely part of my commitment to teach baby A my mother tongue, Bahasa Indonesia. Also the fact that I have the best parents in law in the world who are supportive and understand that their granddaughter will become a bilingual child. They never complaint if sometimes I forgot to translate what I have been talking about to our daughter. We have agreement that they can ask me whenever they want if they are curious to know what is the content of my conversation with baby A using Indonesian language. Actually, at home my hubby P and I speaks English to each other. Why? Yeah, the main reason is because we are too lazy *huge grin* 😀 and the other reason is I want to practise and don’t want to lose my English. Yeah, you might think that I am crazy but I have experience where I lose my ability to communicate by using Japanese language because I never practise it at all for almost 14 years. Yeah, back to 2000-2001, I was able to communicate with Japanese guests that came to the restaurant where I work in Singapore. My Japanese wasn’t perfect but I was succeed to speak, made a joke, explain the menu and served them. I worked in Japanese restaurant too when I was in Bali. Since I left Singapore, I never use my Japanese language anymore and as the result, I completely lost it. I still kept my handwriting Hiragana and Katakana alphabet but I couldn’t find my Kanji though. I still have a dream that one day I would have chance to learn Japanese again. Honestly, I don’t want to lose my English as I lost my Japanese. I could say that this might be the main reason (in my part) why we keep speaking in English to each other. I am a lucky girl that my hubby P is willing to help me to improve my English. It means that papa P and I speaks English to each other, I speak completely Indonesian language to baby A and papa P is speaking Swedish to her 😀 We hope that our Sunshine would be able to speak at least two of them and we will try our best to make it happens. 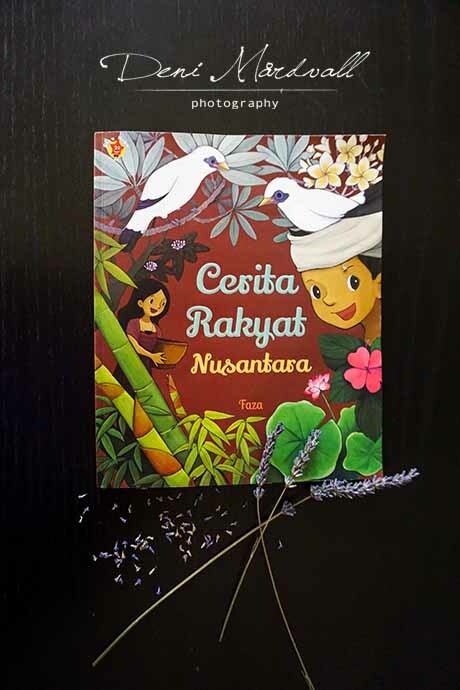 As you see in this post that I took some pictures of baby A favorite books, some of them are in Swedish language and some of them are in Indonesian language. We read story every night but sometimes in the morning and afternoon too. She knows which one that she wants us to read and usually she will bring a spesific book to a specific person. 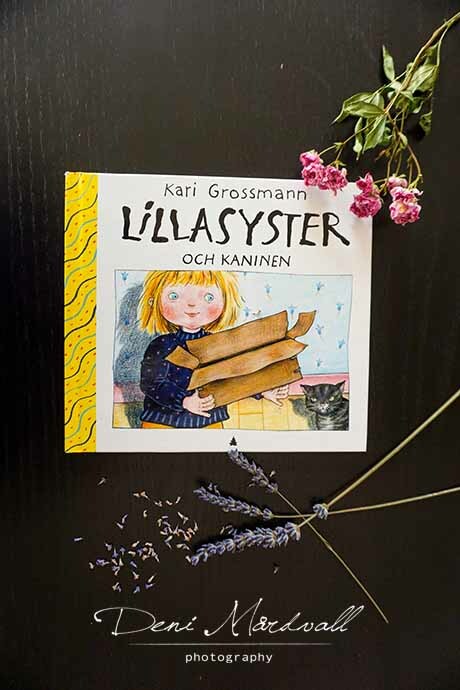 For example, she would bring a book called ’Lilla Syster’ to farfar, farmor or pappa to read and she will bring Indonesian fairytales to me. Her favorite fairytales in Indonesian language is called ”Cindelaras” which tells a story about a Kingdom where the King made a mistake by sending his wife to the jungle and finally he realized that he made huge mistake and at the end he made everything better for the family. Until now, we always bring the small books of Indonesian fairytales wherever we go. I haven’t been able to take picture of her English books collection yet but hopefully I would take some shot for the whole collections later on. Teaching baby A Indonesian language while I am away from my hometown is quite challenging but once again, this is a commitment that I made when I change my tittle from a single woman to a mom. I know it would not be easy but I believe, as long as you do it with your whole heart then you will succeed. Of course then you have to have a team work, someone who support you and pick you up when you are down and I am a lucky one. I have my lovely hubby P beside me who is always there when I need support, advise or when I just need someone to listen too or shoulder to cry on. We are as a team is working really hard to catch our dream as a family one by one. We will do our best to give our Sunshine all the possibility to learn about anything, to be what she wants to be and to catch every single dream that she dares to dream. We are a very solid team and will always be one! Psssst, that is also why in this blog I wrote some posts in Indonesian language, so I can encourage baby A to learn Bahasa Indonesia as best as she can so she can read those posts and understand her journey since she was in my womb, her mom’s journey and what joy and happiness she brought to us. Once again, this is a dream that we as a parents together with baby A will catch it succesfully! This entry was posted in 2015, Being 38, photography, thought and tagged 2015, book, photography, thoughts. Bookmark the permalink. Kembaran, kok kita samaan siiihhh… Aku dulu juga lancaarr bahasa Jepang. Aku pernah nulis diblog tentang bahasa2 asing yang kupelajari. Tapi karena semua ga pernah dipakai, lenyaplah ga berbekas, kecuali bahasa arab masih terpakai sesekali. Huuuuaaaa berarti kita semakin kelihatan kembarnya 😀 Kembar beda telur, satu telur ayam dan satu telur bebek hihihi. Waaaahhh mau don dikenalin sama temennya, sapa tahu dikasi tips and trik gitu hehehhe Itu bakalan mimpi yang jadi kenyataan kalo A bisa lebih dari 2 bahasa, ameeenn. Halo salam kenal! BTW, kayaknya saya kenal kamu deh, dulu kita kontakkan di multiply. nama Multiply saya dulu luluone.multiply,com. Pas kita kenal dulu, saya masih di Surabaya, sekarang udah 4 thn di Jerman. Btw, perlu bamnget pake bahasa Indonesia ke anak ya, karena kan punya anak dari mixed marriage itu anugerah dalam artian, gak usah les bahasa, anak bisa banyak bahasa. Plus emang karena kita kan orang Indonesia. Saya juga pake bhs Indonesia ke anak, dan suami pake Jerman, kita sendiri pake Inggris tapi kadang Jerman, dengan alasan yang sama. Saya gak mau bhs Inggris saya jadi roten. Tantangang berat ya tetep harus kuasai bhs Jerman juga,karena tinggal disini kan.
Waaaah tinggal di Jerman, deket berarti bisa ketemuan ntar kalo aku ada rejeki main ke Jerman hehehhe. Iya insha allah bisa ketemuan ya.Betul, tantangan terasa kalau anak masuk sekolah, semoga kita bisa commit ya. Anak kita bisa lancar bhs Indonesia. Waah padahal mau belajar bahsa Jepang ama kamu. Semangat ya ama bhs. Swedia.